Alejandro Raeshod Perkins, fondly known as “Al,” is a native of Dallas, Texas. 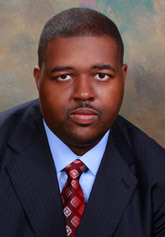 He earned his undergraduate degree in Political Science from Xavier University of Louisiana in 1999 and his Juris Doctorate from Southern University Law Center (SULC) in 2004. After a two-year judicial law clerkship for the Honorable Judge Wilson Fields at the 19th Judicial District Court, he joined Hammonds, Sills, Adkins and Guice law firm. Al is a litigator specializing in complex litigation, general liability, workers’ compensation, labor and employment, education law and insurance defense and as of January 2013 he is the youngest partner of the firm. Al is also an adjunct professor at Southern University Law Center. Al’s value system is strongly rooted in service to others. Through his active involvement in the local, regional and national legal societies, he’s been able to use his personal achievements as a vehicle to uplift others. He recently served the National Bar Association as Deputy General Counsel, appointed by President Ben Crump. He served two terms as President of the Louis A. Martinet Legal Society - Greater Baton Rouge Chapter. Under his leadership, the membership of Martinet was restored and subsequently flourished. He’s partnered with the Marshall-Brennan Constitutional Literacy Project, served as National Bar Association Director of Region V, which includes Texas, Louisiana and Mississippi, and served on the Board of Governors for the National Bar Association. On December 4, 2017, he was inducted to The 100 Black Men of Metro Baton Rouge. Mr. Perkins has had the distinction of being recognized by both of his Alma Maters Xavier University and Southern University Law Center. In 2015, Xavier University recognized Al as one of its top 40 under 40 for his vast accomplishments and service to his community. Southern University Law Center awarded Al the honor of 2013 Distinguished Alumnus in recognition of his many accomplishments to the legal profession and unwavering commitment towards ensuring others have access to education. He has received the President's Leadership Award from the National Bar Association in 2016 and 2012. He has been featured in a number of publications including The Advocate, Times-Picayune, “Around the Bar” Baton Rouge Bar Association, LSBA Journal, and the American Bar Association Journal. He has been a speaker all over the nation on various legal and professional topics. In July 2016, Al was appointed by Gov. John Bel Edwards to the Board of Supervisors for the University of Louisiana System. In January 2017, Al was selected by his fellow board members to serve as the Chairman of the Board for the University of Louisiana System. The UL System consists of over 90,000 students and 9 universities including: Grambling State University, Louisiana Technical University, University of Louisiana Monroe, University of Louisiana Lafayette, University of New Orleans, Southeastern State University, Northwestern State University, Nicholls State University and McNeese State University. In addition to his leadership in the legal community, Al is a Louisiana Arts and Science Museum Board Member, National Annual Fund Chair for Xavier University, and Vice President of the Xavier University Alumni Association-Baton Rouge Chapter. Al believes in paying it forward and is a strong financial supporter of many organizations including his alma maters - Xavier University, Southern University Law Center, Bishop Dunne Catholic School - Alpha Phi Alpha Fraternity, Delta Sigma Theta Sorority, the Louisiana Black Hall of Fame, and Good Street Baptist Church just to name a few. Al is a member of the First Community Antioch Baptist Church in Lutcher, Louisiana where he has worked with the Youth Ministry. He is a proud Lifetime member of Alpha Phi Alpha Fraternity, Inc. and is a member of the Masonic Lodge. In his spare time, he enjoys spending time with his wife, Dina, and daughters, Alexia and Zaiya, listening to great music, developing business ideas and offering his time and talents to inspire our youth. His desire is to bridge the philosophical divide between yesterday’s history makers and tomorrow’s leaders and innovators.